The 2nd Generation Apple tablet computer is on sale from today in the US. It should be available in a number of other countries including the UK on March 25th. Slimmer than the original at 9.5in x 7.31in x 0.34in (241.2mm x 185.7mm x 8.8mm) and lighter too at around 1.33 pounds (600g) that's 33% thinner and 15% lighter. Powered by a custom designed 1GHz dual-core Apple A5 processor, with a 9.7 inch (diagonal) LED backlit multi-touch display providing a graphics resolution of 1024×768 pixels. The battery will allow up to 10 hours of use from a full charge. New features include 2 cameras - a front facing camera providing VGA quality at up to 30 frames a second with audio, to support Apples' FaceTime video calling facility and a back facing camera that allows recording HD images/video. The still back-facing camera provides 5x digital zoom. A 3-axis gyro, Accelerometer Ambient Light Sensor and Digital Compass are incorporated. Available with 16GB, 32GB or 64GB of storage in either Wi-Fi only or Wi-Fi + 3G versions. Prices start from $499. The iPad 2 Smart Cover provides additional protection and can fold in just the right places to create a stand for holding the iPad. The Samsung Galaxy Tab was launched at the recent consumer electronics show IFA 2010 held in Berlin and Samsung have now released an official video to show off this new device in more detail. 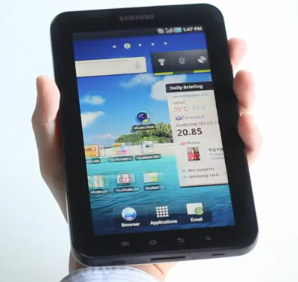 The Galaxy Tab is a smart media device and is destined to compete with the iPad. Overall the dimensions are 19 x 12 x 1.2 cm (so it comes in at approximately half the size of the current Apple iPad) and it weighs 380g. The display is a 7inch TFT touchscreen with a resolution of 1024 x 600 at 169ppi. Included is a forward facing (1.3 megapixel) camera for making video calls and a rear mounted camera (3.0 megapixel) with the ability to record HD video. and of course, it can be used to make calls too . Scheduled for release in November, Amazon are currently advertising availability on 1st November at a price of £599.99 for a 16Gb version. RearType is a project from Microsoft and others, that explores a text entry system for mobile devices using normal keyboard keys that are placed on the back of the device. This approach helps to resolve the problem where a users fingers and hands occlude the touch point(s). In RearType, a standard keyboard layout is split and rotated so that hands gripping the device have the usual keys under the fingers. This allows for 10-finger, tactile, touch-typing which may be better and quicker than using an on-screen keyboard for touch devices. An annual showcase 'Research in Action' describes Research work from the Department of Computer Science at the University of Toronto. This project was described during the last event held in November 2009. 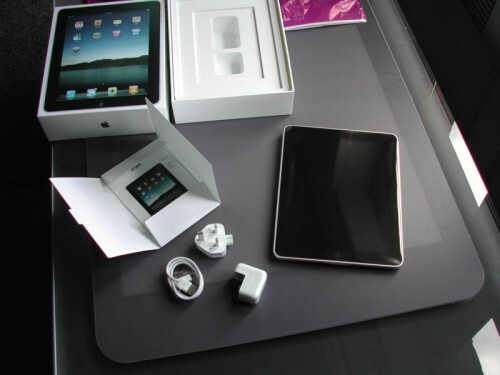 Finally, the iPad has been released and is available in the UK. On release day, I called into PCWorld on the way to work and lo and behold there it was 10 minutes later I had one in my grasp together with some 'extras' a case and screen protector. I obtained the 32GB wi-fi version - as I will mainly be using it in the office and from home I declined the opportunity to obtain a 3G version. Time will tell whether a 3G version would be better. Not a great deal in the box just the iPad, charger and USB cable. The charger is a 10W unit and various notes on the web discuss problems charging from a USB port. The official word from Apple states that to charge the battery you can connect to a high-power USb 2.0 port or connect to a power outlet using the power adapter, and comments that some USB ports do not provide enough power to charge the iPad and will display 'Not Charging'. None of my (desktop or laptop) machines, apparently, will charge the iPad howeverit does appear to charge in spite of what is displayed although very slooooowly. Switch on, connect to iTunes, using the USB cable perform an initial sync and you're good to go. In some respects that's exactly what it is, however the increased size provides a similar but different user experience. It is more comfortable to read and use and the increased screen estate allows for different layouts for the basic applications which are installed by default. Certainly, if you've ever used an iPhone or iPod Touch you'll know how to use one of these. Pretty much the case. The keyboard is on-screen when required and when in landscape orientation can consume half the screen - however, this does enable something closer to a full-size keyboard that you can touch type with. You can also buy a docking keyboard as an optional extra if you prefer. After holding it for a while you may start to notice how heavy it is. The wi-fi model comes in at 1.5 pounds (0.68kg) and the wi-fi + 3G model is 1.6 pounds (0.73kg) Also it takes a while to find the position which you find most comfortable. If you want to read a book how would you hold it ? You try and hold it like a physical book but after a while you probably leave it resting on you lap although tilted at a slight angle. The tilt angle is probably an important factor here and it certainly does seem more comfortable at an angle rather than when laid flat on your lap or a work surface. It is possible to buy a case as an optional extra from Apple that enables you to use it as a stand at an angle of approximately 30 degrees although there are mixed reports about the case. Certainly true - graphics quality seems excellent and I couldn't fault the ease for viewing graphics. I like the glossy screen too although its not to everybody's taste . The 32GB wi-fi model is £499 which pus it out of the reach of a lot of users. Would it be more cost effective to go for a netbook/laptop ? - almost certainly just as you get more value for money if you buy a desktop machine rather than a laptop. The jury is out on whether the iPad is really worth it. The MiFi device from Novatel converts any 3G signal into WiFi so that you can create your own Mobile Hotspot. Simply insert a 3G Sim and you can connect up to 5 wifi enabled devices simultaneously within a range of 10m. It includes a rechargeable Lithium Ion battery that provide up to 4 hours continuous use, is GPS enabled and has a built-in microSDHC slot to provide storage capacity up to 16GB. Dell are now talking in more detail about their 5-inch Android Tablet device. At 5 inches it's slightly bigger than an iPhone, but does that make it a tablet? The Streak will launch initially in the UK in early June (at O2 and the Carphone Warehouse stores and the Dell Uk Website) followed later in the summer in the US at prices yet to be announced.